Summer is nearly over but caring for your body never does and we always need protection. I for one always try and use products with SPF in it somewhere, whether it’s my skincare, makeup or sunscreen but sometimes it doesn't happen and that isn't good. We tend to forget that it’s not just our face or bodies, feet, hands, neck and backs – it all needs coverage to be protected. With two different types of Ultraviolet Rays it’s sensible to look for products that have both coverages if possible. UVA is able to pass through glass and may cause premature aging and wrinkling of the skin. UVB is linked closer to the development of skin cancer and melanoma. UVB radiation causes sunburn but does not penetrate through car windows or other types of glass. Garnier Ambre Solaire have launched a sensitive advanced range for skin protection with high SPF 50+ & UVA & UVB protection, if you or your children burn quickly due to being fair, sensitive & sun intolerant skin, this range is a must have, you’ll also find a preference with formula between lotion and spray - Garnier Ambre Solaire Sensitive Lotion SPF50+ & Garnier Ambre Solaire Sensitive Advanced Very High SPF 50+. It’s free from perfume, parabens & colourants. It has a Hypoallergenic formula, light texture while being non sticky & whitening, so if you want to wear this under make-up, don’t worry about flashback. I personally have the opposite issue, I find it hard to tan, I might brown a little but nothing major but I also don’t burn so I can’t comment on the range too much on how it performs. Badger Balm have SPF30 certified organic ingredients within their sunscreen and protection against UVA & UVB, so if organic is more your thing. Badger Sunscreen SPF30 Unscented is organic & vegan and like all of the sunscreen in the range are Nano free. Badger Kid Sunscreen SPF30 Tangerine & Vanilla, with most children loving to be in the water during holiday’s & in local pools…this provides up to 40 minutes’ water resistant coverage for your little ones. Being chemical free it’s 100% safe for them and being that it smells delicious, children won’t hesitate but want to cover themselves in it. We can’t forget the bambinos, Badger Baby is also water resistant and paediatrician tested & approved, it has a slight smell of chamomile & calendula. These all RRP for £14.99 each and can be used for all ages to be honest. I've mentioned nano free and you might huh? Badger Balm brief this by explaining "Zinc oxide is a powdered mineral that sits on top of the skin, scattering, reflecting, and absorbing UVA & UVB rays. Although zinc oxide is the safest and most effective active sunscreen ingredient, the best protection from the sun is to seek shade and cover up with clothes and a hat. All Badger sunscreens use pharmaceutical grade uncoated Non-Nano Zinc Oxide as their only active ingredient." How good are you with your sunscreen care? Some great products that I hadn't heard of. I wear SPF every day as I have very pale and sensitive skin (plus, you know, wrinkles etc) so this was really interesting. Thanks! Gotta love Impulse that sure is a throwback. SPF is a must, I need to wear it more often! Lots of great products here. It's so important to protect your skin. It really is, protect it all the time, can't reverse the damage. Awful! Never wear it because it's never nice out - never get a tan, or burn. Sad though that it takes the sun having to shine to remind me that I need to protect my skin. It's true, wouldn't beat yourself up about that because we can all be guilty of it. We're just never taught to think any other way. I keep forgetting to buy sunscream, well when it hot I hibernate anyway. 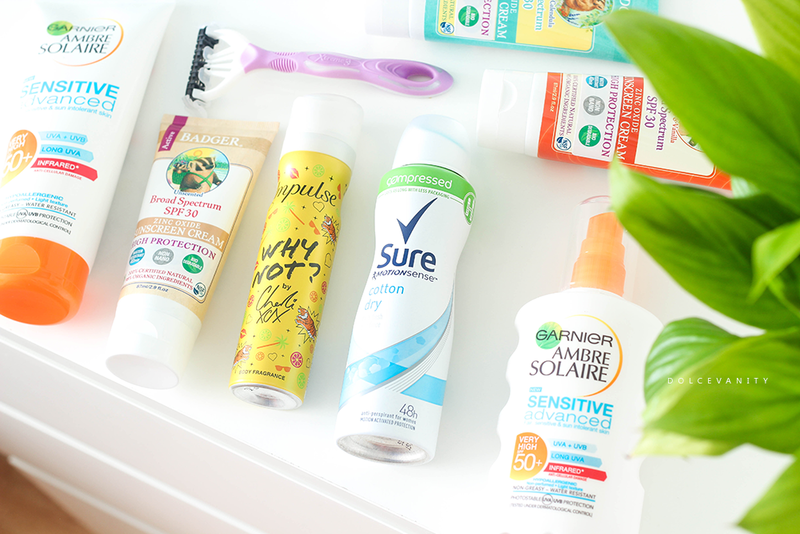 Lots of great products and I come back for reference when I do go out in the sun. Thanks lovely. Yeah my neighbour is the same, hibernates when the suns out. I am obsessed with looking after my skin in the sun. i have a lot of moles, so I have to. That's so good, love the 'obsessed' part. Yes that's true if you do have moles need to protect them even more! I use a factor 50 daily and even try and remember to use it in the winter. You're really good! That's very positive, your skin is no doubt loving you! I'm actually really good, on holiday I worked from 30 to 20 to 10 and used balm with SPF for my lips toooooo! I just forget your meant to use it on a daily basis, I think my moisturiser has SPF 15 either way. You was definitely sorted while on holiday, that's so good to know. Yes girl, SPF balm for the lips!! Yeah we can all be guilty of the daily SPF! I always wear a good SPF - I've got so much on today! I have such fair skin and really should take care of my skin much more, this post is so helpful to make sure I do it! I am so bad when it comes to SPF care, even on holiday I never use it, which is so bad! Very good post! I'm not ery good in sun protection myself, as I don't really stay much in sun, but I know I should use more protection anyway.